A dramatic and unfortunate game is playing north – way up north – and it’s pitting economics against the environment. Last month, the Arctic Ocean – normally a no-go area for all but the bravest of sailors in specially-constructed icebreakers – saw the first ever container ship slip alone, and somewhat gingerly, through its seas. The Venta Maersk sailed from Vladivostok on Russia’s east coast to St Petersburg on the Baltic coast. So what made the Venta Maersk’s trip possible? In brief: global warming. 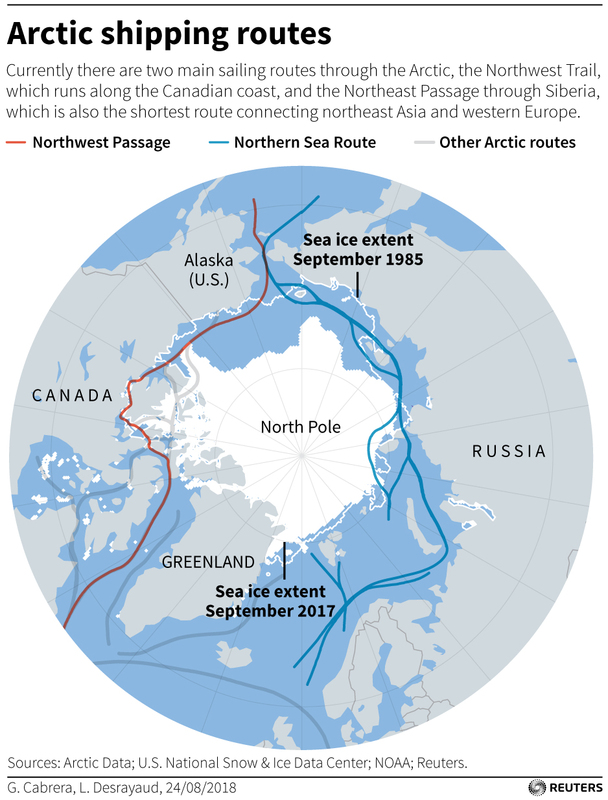 The area of the Arctic Ocean covered by ice has shrunk to such levels that the narrow and winding sea routes through it have become wider and a bit more tantalising for major shipping firms like Maersk. The current sea routes through the Arctic Ocean are seasonal, and largely uneconomical: more expensive ice-classed vessels are needed, transit fees are higher, Russian icebreaker escorts charge hefty fees, and because of the unpredictability of the ice coverage and search-and-rescue support, insurance rates are sky high. Whereas less ice in the Arctic Ocean could offer opportunities for shipping companies plying the prosperous route between Asia and Europe, it is a major concern for those sensitive to the environmental costs of increased shipping: pollution, oil spills, and disturbances to marine life. Ironically, the Venta Maersk’s cargo was frozen fish. It’s ironic that a major contributor to global warming is just what we’ll need more of as the globe warms: air conditioners. They are guilty of contributing to global warming on three counts: they’re heavy users of electricity, they pump hot air out as they cool inside, and the refrigeration process within them uses greenhouse gasses, usually hydrofluorocarbons (HFCs) or hydrochlorofluorocarbons (HCFCs). But those gasses days are numbered. Under the Kigali Amendment to the Montreal Protocol, from January 2019, all countries must gradually phase down HFCs and HCFCs by more than 80 per cent over the next 30 years and replace them with more planet-friendly alternatives. That means all existing air conditioning units – domestic, industrial and vehicular – will have to be ‘retrofitted’. That’s challenging enough until you factor in that 60 million air conditioning units are sold in China alone every year. A growing economy comes with a greater demand for creature comforts! Plus there’s the small issue that replacement refrigeration methods come with their own challenges – some are flammable and some are toxic. Air conditioning is a trade-off: for those living in hot climates, it’s necessary for health and well-being, for the planet, currently, perhaps not so. No, we won’t say, “High”. The South African Constitutional Court has ruled it is now legal for adults to cultivate and smoke cannabis – marijuana – in their homes. It is a bold move, and the reaction was as expected – a mixture of shock and celebration. The shock was from those who argue it shouldn’t be legal for adults to consume something that is intoxicating and dangerous to their health as well as the safety of others. That’s fair, but it ignores an inconvenient truth: alcohol, the consumption of which is not only allowed but encouraged through advertising and sports sponsorships. And that’s where the celebration comes in, because the ruling wasn’t a thumbs up for cannabis, it was a ruling on the rights of privacy – what adult citizens are allowed to do in the comfort of their own home. According to the ruling, just as citizens are allowed to have a beer in front of the TV, they should be allowed to smoke a joint. The ruling is not a licence for everyone to get stoned, and it certainly doesn’t mean humanity is now heading for the pit of hell; because whereas research shows cannabis has medicinal benefits, there is no medical benefit to alcohol apart from the sterilisation of surgical instruments.